The United States Air Force's secretive X-37B space plane has been circling Earth for more than 10 months, and there's no telling when it might come down. As of Friday (Jan. 20), the mysterious robotic X-37B spacecraft has been aloft for 321 days, significantly outlasting its stated mission design lifetime of 270 days. But it may stay up for even longer yet, experts say, particularly if the military views this space mission — the second ever for the hush-hush vehicle — as something of an endurance test. "Because it is an experimental vehicle, they kind of want to see what its limits are," said Brian Weeden, a technical adviser with the Secure World Foundation and a former orbital analyst with the Air Force. The Air Force launched the X-37B in March 2011, sending the reusable space plane design on its second space mission. The X-37B now zipping around our planet is known as Orbital Test Vehicle-2, or OTV-2. Racking up a lot of time in space might be a key part of the current mission, according to Weeden. "I think they didn't want to push it, just because it was the first of its kind," he told SPACE.com, referring to OTV-1's flight. "But I think that they are looking to push the second one." Statements from Air Force officials appear to support Weeden's supposition. "This successful flight is important in the progression of the X-37B program, moving us forward in our effort to prove the utility and cost-effectiveness of an unmanned, long-duration, reusable spacecraft," Air Force Lt. Col. Tom McIntyre, the X-37 systems program director, told SPACE.com in late November, when OTV-2 hit the 270-day milestone. "We look forward to trying to expand the platform's envelope by extending the mission further," McIntyre added. 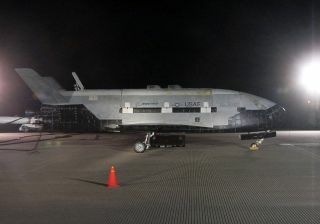 The X-37B looks a lot like NASA's now-retired space shuttle, only much smaller. The unmanned vehicle is about 29 feet long by 15 feet wide (8.8 by 4.5 meters), with a payload bay the size of a pickup truck bed. For comparison, two entire X-37Bs could fit inside the payload bay of a space shuttle. Just what the X-37B does for so long while circling our planet remains a mystery, because the space plane's payloads and missions are classified. Partly as a result of the secrecy, some concern has been raised — particularly by Russia and China — that the X-37B might be a space weapon of some sort. But the Air Force has repeatedly denied that charge, claiming that the vehicle's chief task is testing out new technologies for future satellites. That's likely to be the case, said Weeden, who published a report in 2010 that investigated the X-37B and its likely missions. The Air Force doesn’t disclose the X-37B's orbital parameters, but amateur observers have tracked the movements of both OTV-1 and OTV-2. They've found that OTV-2 is not looping around Earth in a polar orbit, which enables a good look at every spot on the globe. Rather, the spacecraft is flying repeatedly over the stretch of Earth from 43 degrees north latitude to 43 degrees south latitude. Weeden thinks the space plane may be observing the Middle East and Afghanistan with some brand-new spy gear, perhaps instruments optimized to observe in wavelengths beyond the visible-light spectrum. Earlier this month, an article in Spaceflight Magazine, a British publication, speculated that OTV-2 might be spying on Tiangong 1, China's recently launched prototype space module. But the orbits of the two robotic vehicles are quite different, making this scenario highly unlikely, Weeden and other experts have stressed.